Top: Blue Persian. Prize-winner at Westminster in 1899. The first Persian was presented at a cat show at the Crystal Palace in London, England in 1871. As specimens closer to the Persian conformation became the more popular types, attempts were made to differentiate it from the Angora. The first breed standards (then known as points of excellence) was issued in 1889 by Harrison Weir, the creator of the first cat show. He stated that the Persian differed from the Angora in the tail being longer, hair more full and coarse at the end and head larger, with less pointed ears. Not all cat fanciers agree with the distinction of the two types and in the 1903 book "The Book of the Cat" Francis Simpson states that "the distinctions, apparently with hardly any difference, between Angoras and Persians are of so fine a nature that I must be pardoned if I ignore the class of cat commonly called Angora". Our pedigree imported long-hairs of to-day are undoubtedly a cross of the Angora and Persian ; the latter possesses a rounder head than the former, also the coat is of quite a different quality. The coat of the Persian consists of a woolly under coat and a long, hairy outer coat. In summer it loses all the thick underwool, and only the long hair remains. The hair is also somewhat shorter on the shoulders and upper part of the hind legs. Now, the Angora has a very different coat, consisting of long, soft hair, hanging in locks, inclining to a slight curl or wave on the under parts of the body. The hair is also much longer on the shoulders and hind legs than the Persian, this being a great improvement; but the Angora fails to the Persian in head, the former having a more wedge-shaped head, whereas that of the modern Persian excels in roundness. Of course. Angoras and Persians have been constantly crossed, with a decided improvement to each breed; but the long-haired cat of to-day is decidedly more Persian-bred than Angora. Champion lamented the lack of distinction among various long-haired types by English fanciers, who in 1887, decided to group them under the umbrella term "Long-haired Cats". 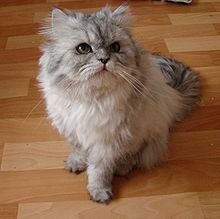 Doll Face Persian is considered as a true breed of persian cat. This breed did not change its physical appearance but some breeders in America and other parts of the world started to interpret the standard differently. In the late 1950s a spontaneous mutation in red and red tabby Persians gave rise to the peke-faced Persian, named after the flat-faced Pekingese dog. It was registered as a breed by the CFA but fell out of favor by the mid 1990s due to serious health issues. In fact, only 98 were registered between 1958 and 1995. Despite this, breeders took a liking to the look and started breeding towards the peke-face look. The over-accentuation of the breed's characteristics by selective breeding (called extreme- or ultra-typing) produced results similar to the peke-faced Persians. The term peke-face has been used to refer to the ultra-typed Persian but it is properly used only to refer to red and red tabby Persians bearing the mutation. Many fanciers and CFA judges considered the shift in look "a contribution to the breed"
In 1958, breeder and author P. M. Soderberg wrote in "Pedigree Cats, Their Varieties, breeding and Exhibition"
While the looks of the Persian changed, the Persian Breed Council's standard for the Persian had remained basically the same. The Persian Breed Standard is, by its nature, somewhat open-ended and focused on a rounded head, large, wide-spaced round eyes with the top of the nose leather placed no lower than the bottom of the eyes. The standard calls for a short, cobby body with short, well-boned legs, a broad chest, and a round appearance, everything about the ideal Persian cat being "round". It was not until the late 1980s that standards were changed to limit the development of the extreme appearance. In 2004, the statement that muzzles should not be overly pronounced was added to the breed standard. The standards were altered yet again in 2007, this time to reflect the flat face, and it now states that the forehead, nose, and chin should be in vertical alignment. In the UK, the standard was changed by the Governing Council of the Cat Fancy in the 1990s to disqualify Persians with the "upper edge of the nose leather above the lower edge of the eye" from Certificates or First Prizes in Kitten Open Classes. 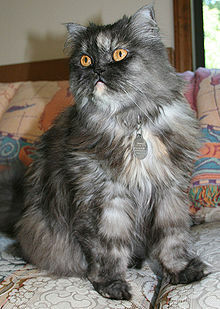 While ultra-typed cats do better in the show ring, the public seems to prefer to less extreme older "doll face" types. In 1950, the Siamese was crossed with the Persian to create a breed with the body type of the Persian but colorpoint pattern of the Siamese. It was named Himalayan, after other colorpoint animals such as the Himalayan rabbit. In the UK the breed was recognized as the Colorpoint Longhair. The Himalayan stood as a separate breed in the US until 1984, when the CFA merged it with the Persian, to the objection of the breed councils of both breeds. Some Persian breeders were unhappy with the introduction of this "hybrid" into their "pure" Persian lines. The CFA set up the registration for Himalayans in a way that breeders would be able to discern a Persian with Himalayan ancestry just by looking at the pedigree registration number. This was to make it easy for breeders who do not want Himalayan blood in their breeding lines to avoid individuals who, while not necessarily exhibiting the colorpoint pattern, may be carrying the point coloration gene recessively. Persians with Himalayan ancestry has registration numbers starting with 3 and are commonly referred to by breeders as colorpoint carriers (CPC) or 3000-series cats, although not all will actually carry the recessive gene. The Siamese is also the source for the chocolate and lilac color in solid Persians. The Persian was used as an outcross secretly by some American Shorthair (ASH) breeders in the late 1950s to "improve" their breed. The hybrid look gained recognition in the show ring but other breeders unhappy with the changes successfully pushed for new breed standards that would disqualify ASH that showed signs of hybridization. 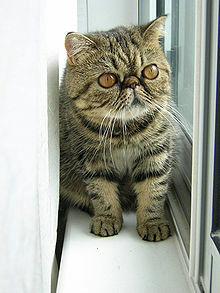 One ASH breeder who saw the potential of the Persian/ASH cross proposed and eventually managed to get the CFA to recognize them as a new breed in 1966, under the name Exotic Shorthair. Regular outcrossing to the Persian has made present day Exotic Shorthair similar to the Persian in every way, including temperament and conformation, with the exception of the short dense coat. It has even inherited much of the Persian's health problems. The easier to manage coat has made some label the Exotic Shorthair the lazy person’s Persian. Because of the regular use of Persians as outcrosses, some Exotics may carry a copy of the recessive longhair gene. When two such cats mate, there is a one in four chance of each offspring being longhaired. Ironically, longhaired Exotics are not considered Persians by CFA, although The International Cat Association accepts them as Persians. Other associations register them as a separate Exotic Longhair breed. In the USA, there was an attempt to establish the Silver Persian as a separate breed called the Sterling, but it was not accepted. Silver and Golden longhaired cats, recognized by CFA more specially as Chinchilla Silvers, Shaded Silvers, Chinchilla Goldens, or Shaded Goldens, are judged in the Persian category of cat shows. In South Africa, the attempt to separate the breed was more successful; the Southern African Cat Council (SACC) registers cats with five generations of purebred Chinchilla as a Chinchilla Longhair. The Chinchilla Longhair has a slightly longer nose than the Persian, resulting in healthy breathing and less eye tearing. Its hair is translucent with only the tips carrying black pigment, a feature that gets lost when out-crossed to other colored Persians. Out-crossing also may result in losing nose and lip liner, which is a fault in the Chinchilla Longhair breed standard. One of the distinctions of this breed is the blue-green or green eye color only with kittens having blue or blue-purple eye color.